A badly equipped group of walkers was rescued after getting lost in worsening weather on Scotland’s most southerly munro. 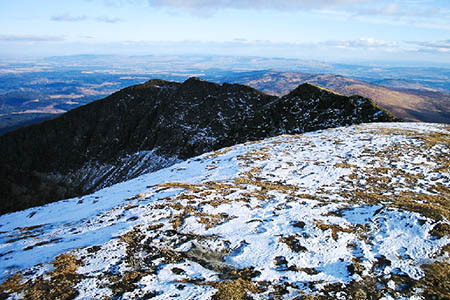 Efforts to find the lost party were thwarted by poor mobile phone signals after Lomond Mountain Rescue Team had been called out to aid the walkers on the 974m (3,196ft) Ben Lomond. A team spokesperson said: “Central Scotland Police contacted the team over concerns for a group of three men, in their early 20s, who had contacted them to say that they were lost on Ben Lomond. “The party was described as being poorly equipped and feeling the effects of the cold. “Contact by mobile phone was intermittent and unreliable. The team leader tried to contact them unsuccessfully both by voice and by text, also attempting to use the smartphone location software Sarloc. “As the team was mobilising, the police managed to contact the group again and they reported that they could see a farmhouse and were ten minutes away. Attention turned to Comer Farm on the opposite side of the mountain as a likely location for the lost walkers. Team members still on their way to the rescue were diverted to Comer, north-east of the mountain. “Fortunately, as the team re-established contact with the missing persons, the group could see a car approaching them,” the spokesperson said. “The driver was a mountain rescue team member. “As it turned out, the group were four in number and not the originally reported three. The weather was turning more wild on the hill with a strong, bitterly cold easterly wind as the evening wore on. Rescuers drove the walkers back round to their vehicle at Rowardennan on the banks of Loch Lomond, west of the mountain. They were unharmed. The rescue ended shortly before 7.30pm.